Fourth Expressionism (tentative) / "Screaming Landscape" Ended. - [TODAY] The 8th Dai2Kin, presented by Takahiro Hirama and Hideki Nakazawa with Uguisu s evuch, will feature Hideki Nakazawa's early works including acrylic painting and Silly CG. Today's guest is Ryosuke Muroi, who is the author of the database of Hideki Nakazawa's works. [time] Nov 11, 2011 7pm- [charge] 1500yen [place] Enban, Koenji, Tokyo, Japan! Made a new webpage. "New Silly CG"
- The 4th, today is the day of publication of our email bulletin "New-Method." 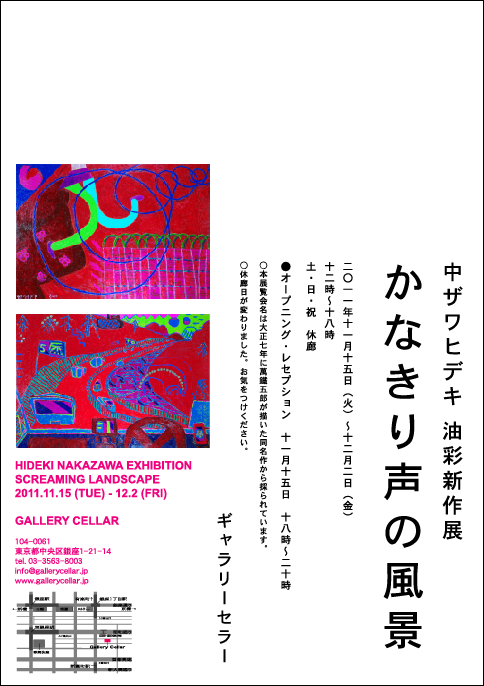 - Hideki Nakazawa New Works of Oil Painting "Screaming Landscape" Nov 15 (Tue) - Dec 2 (Fri), 2011. 12 - 6pm. closed on Sat, Sun, National Holidays. Opening Reception 6 - 8pm on Nov 15. Gallery Cellar = 1-21-14 Ginza, Chuo-ku, Tokyo. www.gallerycellar.jp I will announce further info later. 第七回第二金はQwertyuPoiu Drive！ The 7th Dai2kin will feature QwertyuPoiu Drive! 機関誌「新・方法」第12号堂々刊行！ Bulletin "New-Method" No. 12 Has Been Released! - "6th Dai2Kin" is "New-Method Night Vol. 2," in which we will look back upon the period from the eve of the foundation to the Second Manifesto on "New-Method," whose 1st anniversary was on September 4th. at Enban, Sep 9, 19:00 start, 1500 yen. - Updated the New-Method Page by Hideki Nakazawa. 第二金「ソースと実行」今晩！ Dai2Kin "Source and Execution" TONIGHT! 12日第二金「ソースと実行」 Dai2Kin on 12th "Source and Execution"
Further info will be twitted with the hushtag #dai2kin a few days before. - Distributed "MIDI and 'Method'" in Japanese to the Japanese users only. The content is (1) Ototote #5 (2) Dai2kin feat. Source and Execution (3) New-Method Night Vol. 1 and others. 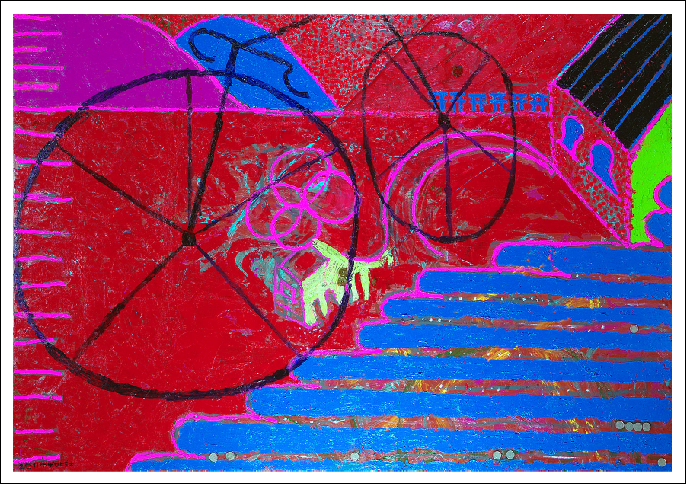 - I will participate in an event "Ototote #5" at Monnaka Tenjo Hall (Art Kitchen) on July 29, 2011, which has been rescheduled from March 11 due to the East Japan Earthquake. I will present again "Part: Hideki Nakazawa, Method Music Concert" which was held at Kyoto Art Center in 2002. 本格油彩画群「セル」 Serious Oil Paintings "Cells"
- Series "Cells" has been added to the Database! Serious Oil Paintings 2008 exhibited at Gallery Cellar located in Nagoya at that time. Thank you to .@archive661! - PDF of the Talk Between Jun Tsuzuki and Hideki Nakazawa on "Vector vs Bitmap" last autumn has been finally uploaded. English translation will come soon. 「一日一品」目次更新 Updated the Contents for "One Art Work A Day"
- Contents (in Japanese) for "One Art Work A Day" has been updated. - My book "Text on Modern Art History" (Tom's Box 1989) will soon be available through the online zinestore "Lilmag." - "The 4th Dai 2 Kinyobi" and " S eviche night" had been done successfully. - "The 4th Dai 2 Kinyobi," planned by Enban, hosted by Takahiro Hirama and Hideki Nakazawa, will be held on coming Friday, July 8th at Enban, Koenji, Tokyo. 7pm- 1500 yen. This time we will talk on and listen to what will be held at 20202 this summer: s evuch.U solo exhibition, Takahiro Hirama Solo Exhibition and Two Persons Show by s evuch.U & Takahiro Hirama. - Minor changed the page of HOME, index_e.html. e.g. "Method" -> "Old-Method"
- Dai2Kin No.3 was excellent! Thank you to Yumiko Haruki, Shogo Baba, Uguisu-san, and those who had witnessed at Enban! - You can buy some of my books at Bar Ginryu (Silver Dragon) or at Enban. 明日は第三回第二金！ The Third Dai2kin Tomorrow! - "Dai2Kin" No. 3 presented by Hirama and Nakazawa with the guests Yumiko Haruki and Shogo Baba featuring "Introduction for New-Method Music" by yum will be held on the 2nd Friday, June 10 at Enban, Koenji, Tokyo. - Come to Bar GINRYU (Silver Dragon), and you will see my Tile Painting No. 13 (2005) ...from tonight until July, 2011. Delivery Art by RED CUBE. - Feb 16 of this year was the first anniversary of my mother's death, Apr 30 of Pugcho's, and May 26 of Poncho's. 「新・方法」第9号刊行！ "New-Method" No. 9 Has Been Published! 「作品データベース」成長中！ "Database of the Works" Is Growing! - "Database of the Works" Is Growing! ... Sereis "Migikata Agari" etc has been added to the database of my works made by Mr. Muroi. Please visit the website. - A bit I changed the appearance of this page. - Thank you to yum: "Introduction for New-Method Music" by yum has been made and uploaded! データベース追加「夏の個展2009」 Added to the Database "SUMMER SOLO EXHIBITION 2009"
- Images and information of "SUMMER SOLO EXHIBITION 2009: The First Period" has been added to my database made by Mr. Muroi ( @archive661 ) ! ＤＢに追加！「夏の個展2009第三部」 Added to the DB! "SUMMER SOLO EXHIBITION 2009: The Third Period"
- Images and information of "SUMMER SOLO EXHIBITION 2009: The Third Period" has been added to my database made by Mr. Muroi ( @archive661 ) ! The style change was shown through these acrylic paintings made with all my might on the year before last. - To the users of AOL: "New-Method" No. 8, published on May 4, was undelivered to the email address of the account for aol.com, because of being reported as a spam. Having fixed the things, I am sending it now. If you want to unsubscribe to it, please let me know. 第二回第二金終了謝謝引続宜敷 Thank you for "Dai2Kin"! - "Dai2Kin" No. 2 presented by Hirama and Nakazawa with the guest Fumiki Hanahara will be held on May 13 at Enban, Koenji, Tokyo. - "Dai2Kin" No. 1 presented by Hirama and Nakazawa with the guest Shogo Baba was performed successfully on Apr 8, featured "Why Not Art?" - I introduced a new theory In the lecture "Japanese Contemporary Art History" held at Bigakko on Apr9. - Group Show "Homage Ken Takakura - Flower and Dragon on the Operation Table" Apr 16 - Jul 18, 2011, Operation Table, Kitakyushu. 8日は円盤、9日は美学校。 Enban on 8th, Bigakko on 9th. - "Dai2Kin" (Second Friday) Enban, Tokyo on Apr 8, 2011. Takahiro Kirama and Hideki Nakazawa are going to launch a monthly event "Dai 2 Kinyobi" (The Second Friday) from the coming Friday, the 8th of April, 2011. Start 7pm. Charge 1500 yen. Place: Enban (Koenji, Tokyo). Lecture series at Bigakko, "Art History in 90 Minutes." Apr 9 17:00-18:30 Dance History by Tetsuya Miyata, 19:00-20:30 Japanese Contemporary Art History by Hideki Nakazawa. Apr 10 17:00-18:30 Photogragh History by Toshiyuki Shinohara, 19:00-20:30 Japanese Illustration History by Jun Tsuzuki. Charge 2000 yen for 1 day, 3000 yen for 2 days. Place: Bigakko (Kanda Jinbocho, Tokyo). - My works painted in the event "Kanketsusen vol. 5" held on Apr 2 are now exhibited through Apr 12 at HIGURE17-15, Nippori, Tokyo. I made about 14 works. I am participating in Vol. 5 of the series "Kanketsusen" promoted by Yuhei Saito tomorrow, on April 2, 2011. - "Second Friday" Enban, Tokyo on Apr 8, 2011. - [To those who exchanged name cards] My email address for mobile phone has changed. My dialing number for mobile phone has not changed. - I stopped carrying one line information in bold letters on the top page. - "New-Method at 2F" New-Method is going to participate in Tamatama event hosted by Hiroyuki Oki at Chateau 2F in Musashi-Koganei just from now. I mulitposted bcc emails written in Japanese only to the users of Japanese together with Takahiro Hirama and Shogo Baba. - I have been carrying one line information in bold letters on the top page since Mar. 10. I updated today. "Sincere condolences on the earthquake tragedy." - Thank you to more than a few people those who emiled me inquiring after our family. We are ok; thank you to your warmest regards. In Tokyo, almost no building has been totally collapsed, neither has come a tsunami, in spite of the huge long quakes which I have never experienced yet. Aftershocks are still coming but getting less and less. On the other hand, we express our sincere condolences to those who are living in the disaster-stricken area, especially Tohoku, north of Kanto, the Pacific seaboard and others. At this moment, 5:30pm Japan time, we are watching the news of the nuclear power station carefully. - Today's concert was cancelled because of the Tohoku Pacific Offshore Earthquake. Take care. Aftershocks are still coming one after another in Tokyo. I mulitposted bcc emails written in Japanese only to the users of Japanese. The content concerns with the event "Ototote #5" which will be held tomorrow. - Updated the Website for New-Method by Hideki Nakazawa. I changed the appearance drastically. I rearranged the "Records" to be seen easily. In addition, I newly made the item "Works of Distribution." - Today is the first anniversary of my mother, Rubiko Nakazawa's death. I made a webpage in Japanese with some scanned jpgs. - [New-Method] Demons Out! Luck In! We arrange coins in rows as what should be done. - I further changed the appearances of the top page. - Email bulletin "New-Method" from me seems to have a tendency of being sort into the spam folders of Gmail users, while such distributions like "Hatsumode" or "Purchase of the Public Lottery Ticket" other than the bulletins seem to go well. Please pay careful attention. - I changed the appearances of the top page and the notebook page. English and Japanese are together in the same page. - I closed the website "DB of Works By Hideki Nakazawa" which has been established on Aug 22, 2010. Only "Prospectus" (English unfinished) has been appeared in the website.